Portland, Oregon musicians Mae Starr and Monte Trent Allen construct toxic clusters & thick webs of grainy ambience & psychedelic primitivism under the Moodring moniker. Moodring came to Silber after a bidding war between Silber, North Pole, & Nillacat. It was a tough fight, but we’re proud to be the victors & getting to present to you their brilliant new album Scared of Ferret. Originally formed in 2005 by Mae Starr (vocals, keyboards, kaos pad, effects) & Monte Trent Allen (bass, effects, hand percussion) as a side project of Rollerball to allow more of the music flowing in their veins to spill out onto the Earth. Their first live show was actually opening for labelmate Remora in Sacramento. Moodring has since become its own animal with a cult following in the Pacific Northwest. They play their flavor of experimental music in basements, bars, & theaters shooting out their super sweet sounds on eager audiences. From 2005-2007 Moodring had six limited run releases on Nillacat as the duo of Monte & Mae. In 2007 Jesse Stevens (Ova/The Plants) joined the live version of Moodring on drums & flute changing Moodring from a spaced out duo into a more traditional band, which strangely enough allowed their music even more freedom to freak out. On Scared of Ferret Stevens acted as recording engineer & Michael Braun Hamilton (Momraths/Nudge/Rollerball) added effects laden bass clarinet making them a quartet. While it’s easy to hear that Moodring is awesome, other words to describe them are a bit harder to come by. The presence of piano & clarinet give a free post-jazz flavor. Mae Starr’s ghostly vocals sound like the lounge music on a sinking ship. The deep groove jams sink in to form some kind of modern American gamelan sound. The music is so raw & infectious & immediate that it feels more proto-everything than post-anything. So just soak it in & sink into the doom. 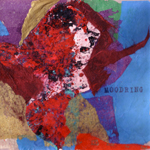 Moodring is back to Silber with art rock jazz meditations recorded on the edge of a volcano. 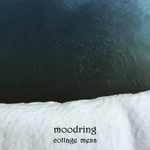 Moodring live recordings from the fall of 2008. Culled from the two performances that solidified Moodring's place in the Silber roster.